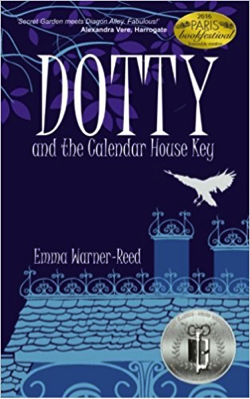 DOTTY and the Calendar House Key: by Emma Warner Reed. This is a magical, fantasy adventure for 8-12 year olds (although the young at heart will love it too). It is the first in the DOTTY Series (paperback – Nov 2016) and it is a great read. I think it works for both boys and girls, but especially girls. Story in brief: tragedy strikes and poor Dotty is sent away to live in a huge, sprawling mansion in the depths of Yorkshire. It’s set in the winter around Christmas time and the early evenings add to the sense of gloom. The house is a spooky place with strange scratching noises coming from the fireplaces and out of the dark in the chimneys. It’s a fun book, though, and Dotty is a strong character. She explores on her rollerblades and Mrs Gobbings (the housekeeper) is also a great character. Cooking scenes are fun too. However, it’s the mystery that holds the reader. It is scary at times as Dotty tries to work out what’s going on. I won’t say more, because I don’t want to spoil a very enjoyable read. It’s Yellowbird Education’s book of the month.